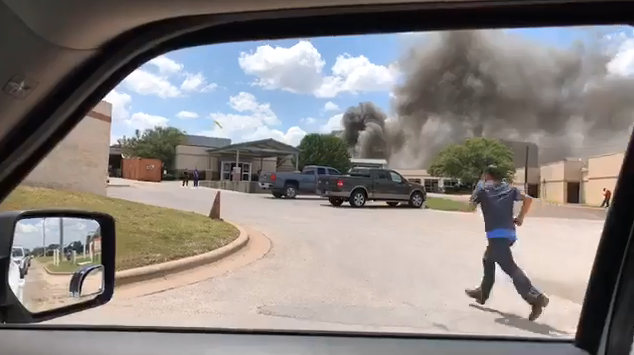 GATESVILLE, Texas -- One person was killed and 12 others were injured during an explosion at a hospital in Gatesville, Texas, authorities said Tuesday. First responders and emergency crews swarmed the area trying to reach the injured at Coryell Memorial Healthcare System. David Byrom, the hospital's CEO, confirmed the number of those injured Tuesday. In a news conference, he said the hospital had been shut down and patients were being transported other facilities in the area. An eyewitness recorded black smoke billowing after the explosion on hospital grounds. The blast was so loud, it shook walls and knocked out power in parts of town, a witness said. Initial reports said the blast occurred in an area where the hospital is being expanded. Investigators are looking into a boiler room that was under construction. Two nursing homes, the Oaks at Coryell and the Meadows, were evacuated after they lost power following the explosion. Coryell County Judge John Firth, the county's top elected official, said the state fire marshal will lead the investigation into what caused the explosion, the Associated Press reports. Another witness, who asked to remain anonymous, told the station there was an electrical generator that blew up and "scattered stuff all over the place."